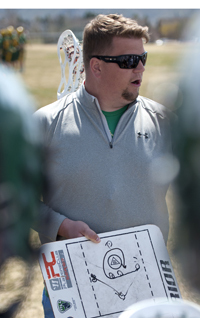 The Wood River Warriors high school lacrosse team (7-1-0) stretched its win streak to six games with a 6-3 Treasure Valley Lacrosse League (TVLL) Div. 2 win over the Ambrose School Archers April 23 in Mountain Home. Evan Telford scored three goals and an assist for the Warriors, who led 4-1 at half. Single goals came from Cooper Bailey, Hayden Thayer and Matthew Fisher. Assisting were Gus Conrad, Bodie Bennett and Matt Galgano. Good ball movement and unselfishness on offense, and stellar defense contributed to the win. Four Warriors goals came with assists, signifying solid passing. Warriors goalie Miles Jones made four saves on seven shots. One big reason for his shortage of saves was the Warriors defense. Zach and Travis Swanson continued to dominate around the crease and block shots, with help from Hans Heaphy, Hayes Gilman, and Asher Loomis. Ambrose goalie Jonathan Miller was busier with 12 saves on 18 shots. Scoring for the Ambrose team from Meridian were Logan Filbert, Weston Liimakka and Matthew Tupper. Still leading the seven-team league over the Borah Lions, the Warriors will clash with Ambrose (4-4-0) again, today, Wednesday at Mountain Home West Elementary School, and then will host their final home game Saturday, May 3 at 5 p.m. at Hailey’s Phil Homer Field (high school football field). The Warriors opponent on Saturday for the home finale will be the Vallivue Falcons (2-3-1) from Caldwell. There will be a brief “Senior Night” recognition before the game for Cooper Bailey, Gus Conrad and Keegan Heneghan. Wood River will play its final two season games at Mountain Home—on Wednesday, May 7 against Emmett (1-6-0) and May 14 against third-place Meridian (5-3-0). Top scorers through eight games are Bailey (18 goals on 53 shots, 3 assists), Thayer (9 goals on 46 shots, 2 assists), Telford (8 goals on 31 shots, 2 assists) and Conrad (8 goals on 57 shots, 2 assists). Jones has made 61 saves on 94 shots.